The reliability of a submersible product will never be better than the reliability of its sealing system. Unlike dry-installed equipment, any fluid leaking through the seals will accumulate in the pump or mixer and cannot be drained during operation. To achieve long service intervals and high reliability, exceptional demands are made on the sealing system for submersibles. To ensure that the seals will meet these requirements, Xylem has chosen to design and manufacture its own Flygt seals. As these seals are designed solely for use in submersibles, there is no need for compromise, and seals can be fully optimized for this single purpose. 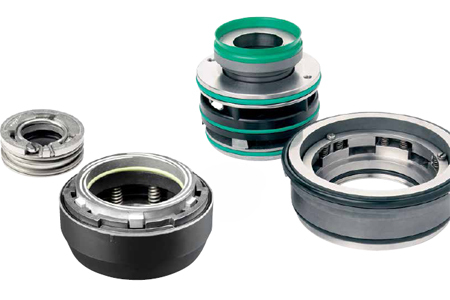 Apart from low leakage rates, the seals are designed to accommodate short shaft overhang. Torque locks and drivers are independent of the shaft rotation and pump pressure acts as a closing force on the seal. Another characteristic of the Flygt seals is that they are versatile. The ultimate goal is that one and the same seal should be able to cope with all applications. Therefore, the outer seal always has hard faces and rubber parts that tolerate high temperatures, even if the pump is used for pumping plain drinking water. With just one standard seal, compatible with most pump or mixer media, the choice of seal is simple. Furthermore, having the seal design and manufacturing in‑house ensures that customers get rapid and accurate responses to any questions or application problems that might arise. The fact that we are the world’s largest producer of submersible pumps and mixers also makes us a major manufacturer of mechanical face seals. Hundreds of thousands seals are produced annually, which provides a more than adequate foundation for continuous research and development.